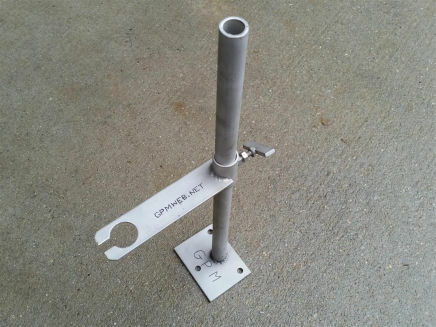 GPM Stainless Steel Ultrasonic Sensor Bracket. This sensor bracket can be made to your flow meter ultrasonic sensor size. 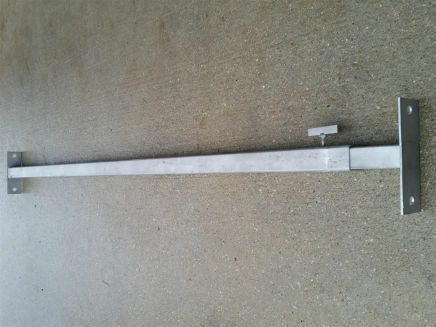 The bracket can be installed near flumes on concrete or inside fiberglass C channel cross member. For weirs the shaft can be used with a differently positioned sensor holder. GPM Stainless Steel Wall-to-Wall Mounting Bar. The mounting bar can be installed in concrete manholes using anchor bolts or the bar can be made with pegs for mounting inside fiberglass manholes. This bar provides secure way of mounting your equipment inside even a large span manholes. 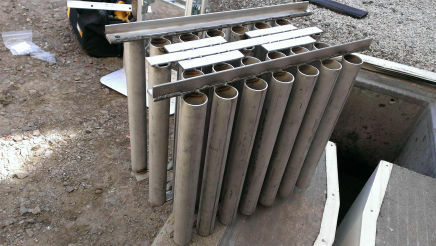 GPM Stainless Steel Baffle Rack. This baffles rack helps in avoiding/eliminating "Rooster tail" effect in water under an ultrasonic sensor which causes errounious level readings and consequently providing faulse flow rate and total flows.